For fashion designers, the civil service uniform project is like "summertime pork," a term Koreans use to describe a situation where those who do something very well gain very little. Just as pork is relatively less enjoyable in summer than in other seasons because it goes bad quickly due to high temperatures, those who design civil service uniforms are rarely complimented by their clients. If their finished work turns out to be a failure, however, disaster occurs ― they face a severe backlash from all stakeholders. The best-case scenario will be that their finished work gets approval without much fanfare. 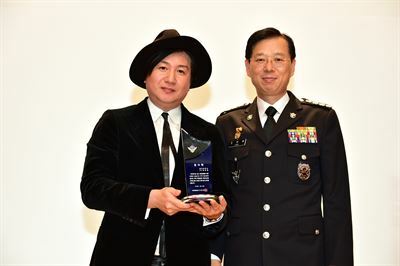 Fashion designer Kan Ho-sup likens his recent project to design uniforms for the Korea Coast Guard to a mission something akin to the summertime pork adage, although he didn't use the term. He said he heaved a sigh of relief after his project didn't create any unwanted controversies. "In a project like designing uniforms or other public service-related work, everybody has a say," Kan said in a recent Korea Times interview at his office in Seoul. "I mean not only those who are wearing them but also ordinary citizens, who appear not to be related to the uniform, make their own comments on it. The sources of their complaints vary. Some complain about the color, while some dislike the design." New uniforms highlight functionality and durability. They are blue to symbolize the seas surrounding the Korean Peninsula. The uniforms feature a line to reflect harmony and unity of the nation. The public's interest in civil service uniforms seems to come from their public nature. Uniforms, for many people, instill respect for authority or power. Clothing, including the police uniform, has been found to have a powerful psychological impact on those who see it. The uniform of a police officer, for example, conveys power and authority. Thus for the uniform designers, these factors are also important to consider. Kan, a professor of fashion at Hongik University in Seoul who also concurrently serves as creative director at high-end French fashion and leather brand in Seoul, said he had worked under immense pressure during the past year but felt extremely rewarded when his team eventually pulled off a nice job. Despite this, the fashion designer admitted working on a uniform project is a high-risk poker game for established fashion designers like him. "If things go badly, it hurts a designer's reputation," he said. "I am a very sensitive, meticulous person and if someone spoke harshly about my uniform project, I would feel extremely uneasy and uncomfortable. As a designer, my top priority is satisfying my clients. Those who wear my works are supposed to be happy with them and feel they are wearable." 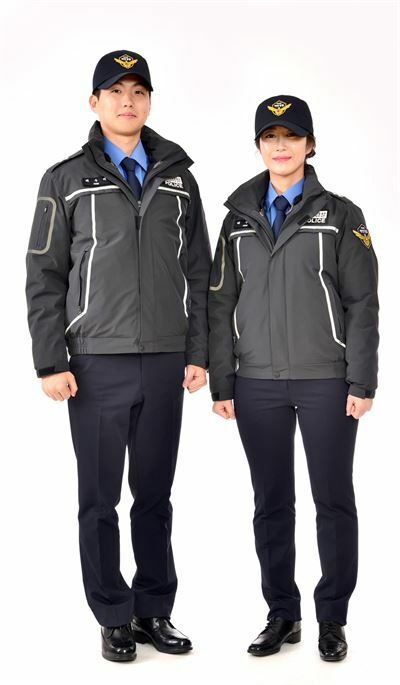 The new Coast Guard uniforms his team designed were approved and the Coast Guard will wear the brand-new design on the occasion of the relocation of its headquarters from Sejong City to the port city of Incheon. It took a whole year for his 18 member team including himself, to finish the project. The new Coast Guard uniform project signals the maritime security forces' fresh start after the government reshuffle. The Coast Guard, established in 1953 after the end of the Korean was dissolved in 2014 after the sinking of the passenger ferry Sewol in the seas off the southwestern island of Jindo in April that year. The maritime disaster killed over 300 people, mostly high school students who were on a school excursion to the scenic island of Jeju. The Coast Guard was one of the groups that were under fire for their mishandling of the rescue then salvage mission in the wake of the ship sinking. Then President Park Geun-hye ordered the Coast Guard to be dissolved, holding them accountable for the disaster. Regarding the highly political decision, political pundits speculated the Coast Guard lost the blame game and as a result suffered the consequences. Part of their maritime security missions went to the National Police Agency and the salvage mission went to the Ministry of Public Administration and Security. The decision created a controversy because the absence of the Coast Guard compromised maritime security. President Moon Jae-in reversed the decision after he took office and reinstated the Coast Guard. He also pushed for relocation of the headquarters from Sejong to Incheon. Kan said the tragic maritime disaster, which dealt a blow to the old Coast Guard, was one of the key themes when he designed the uniform. "The Coast Guard had a traumatic experience after the ship sinking," he said. "Our team also considered functionality and identity of the uniform as well when working on the uniform project." Among other things, he said, his team put an emphasis on the design being waterproof and windproof because Coast Guard members are exposed to severe weather conditions. "We also thought a lot about identity and how their uniforms were different from those of the police. And our proposal highlighted such functionality as well as identity," he said. He said designing civil service uniforms is very different from other apparel designs. "They do have aesthetic value in common. When designing uniforms, we are supposed to consider the identity of the uniforms as well," he said. "Meeting everyone's needs is tough." Kan became known to the public for his appearance in the remake of America's hit reality show "Project Runway." In the show which aired on OCN between 2009 and 2013, Kan played a role similar to that of Tim Gunn, the former chairman of the Fashion School at Parsons, who starred in the American show. Just like Gunn, Kan was the show's beating heart ― he was a mentor, a teacher, a consultant, a friend, a parent, a therapist and a shoulder to cry on.